What does your prospect’s first contact with your company usually look like? Is it in a face-to-face meeting at a networking event? Is it the result of a web search? Is it through a referral? or is it from a direct-mail campaign? The answers to these questions are important in determining how to help your prospect’s mind create a first-impression worthy of the product or service that you provide. Businesses that serve local consumers often meet in person at networking events. Inevitably, the question is asked, “What do you do?” The response is almost always a short verbal summation of the products or services offered and transfer of business cards. The prospect’s mind immediately creates an impression of what you do and files it away to be soon forgotten. Several months later, your prospect runs across your card and cannot remember why he kept it, so he throws it away. So, what happened here? It is very difficult to use verbal communication to develop a memorable impression of what you do. A well designed brochure or flyer would have been a perfect presentation tool for helping your prospect’s mind create a memorable and accurate first impression. It may give them a reason to keep your business card or even visit your website. In the newspaper industry there is a term called “the fold.” The fold is top half of the newspaper when folded in half. It is the space that would be visible when placed in the news stand; therefore, it is considered the highest valued space of the newspaper. So, what does the fold have to do with a website? 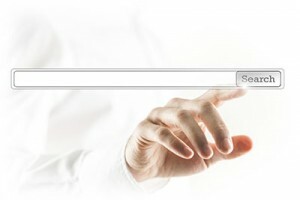 When a user clicks on a link from within a search result, he is taken to a webpage within his browser. Anything that is initially visible upon page load is considered “above the fold.” Any content that requires scrolling is considered “below the fold.” Your visitor’s first impression of your company will be created above the fold. Users that are visiting search engines are looking for answers to their questions and are considered “mission focused.” They will move quickly through each listed result and won’t dig deep into websites to locate answers. Therefore, it is important to present the solution to the problem that your product or service provides clearly and prominently above the fold. To professional sales people, referrals are not an accident or after thought. They occur as a result of carefully nurturing relationships over time. Chances are that the referrals that you receive are from those that know you best and have developed a positive first impression of you. They enjoy sharing their positive experiences of working with others. That story becomes the new prospect’s first contact with your company. So, why not give the referrer the best tools possible to share the story. In fact, how much more effective would the story be if after telling the story the referrer said, “In fact, I happen to have a an extra copy of their brochure sitting back here. Why don’t I give it to you?”, and then gives the prospect the brochure? Once again, the brochure will serve as an effective tool for creating a first impression that truly matches your offering. So many companies have turned away from direct mail postcards as a tool for marketing. As a result, those that are taking advantage of direct mail are seeing less competition and very affordable package deals that are getting amazing results. 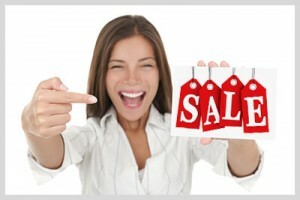 Direct mail campaigns are faced with many of the same challenges that face those getting traffic from search engines. The reader quickly scans the postcard to determine if it is an item of interest and then tosses it in the trash if not. So the front of the postcard has to quickly create a positive first impression. A professionally designed postcard can go a long way toward creating a positive and accurate first impression. They will be far more likely to take the next step whether that be to visit your website or make a call. So, there you have it, four great ways to help your prospect develop a positive and accurate first impression of your company. Sooner or later somebody will ask you, “So, what do you do?” Don’t get caught off guard. Help them answer the question and develop a first impression that is consistent with your offering. Are you prepared to help your prospects create a positive and accurate first impression of your company in when you make first contact? I would love to hear your thoughts and how you help prospects develop a verst impression of your company in a first contact situation. 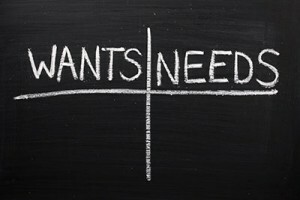 The absolute best way to get more for your offering is to make your customers want what you have to offer. Okay sounds obvious enough. So, what’s the big deal? The big deal is that many of us focus on trying to convince our prospects that we they need what we have to offer–as if need were a stronger motivator. So, it begs the question, which is a greater motivator, need or want? The answer may surprise you. 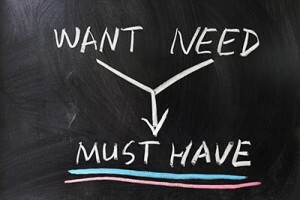 “Obviously, our needs are more important than our wants.” After all, if you need it, you’ve got to have it right? It just so happens that want is the greater motivator. I’m not saying that want is more important to us, just that it is the greater motivator. For example, we all know somebody that frequently travels across town in order to save a few pennies on gas–guilty as charged. Yet, that same person is willing save for a dream house, a dream car or even an education from an elite university. The bottom line is that we don’t enjoy spending our hard-earned money on things that we merely need. The result being that we treat items of need as commodities. We tend to use price as the primary criteria when determining where to purchase our needed items. On the other hand, we get very excited about spending money on items that we want. In fact, it is often considered normal to place ourselves in debt (student loans, mortgages, credit cards, etc.) and spend whatever it takes to acquire the things that we want. It’s hard to imagine someone voluntarily saving to spend more than they absolutely have to on items we need such as gas, taxes or utilities. We have a hard enough time getting people to save for retirement. To answer this question, I will need to get a little philosophical here. Our lives are comprised of a series of experiences arranged chronologically along our life’s timeline. We spend our lives trying to ensure that our lives are filled with as many positive experiences as possible and as few negative experiences as possible. This is why we dislike being board and wasting time. This is also why we respond to marketing that promises positive experiences. That’s right, there it is. The answer to getting prospects to spend more on your products or services is to create marketing materials that demonstrate how your offering will add joyful and happy experiences to their life’s timeline. If you study the television commercials of Apple, you will notice that you are never told how fast or powerful their products are. In fact, you aren’t even told how much their products cost. Every commercial focuses on showing you what your life will be like and how happy you will be if decide to become one of their happy customers. While this technique serves to get your customers to spend more with you, your success will be short lived if you over-promise and under-deliver. A good example of this involves Coca-Cola’s attempt to replace sugar with corn syrup to develop a product called New Coke. Their commercials were filled with people that had participated in taste tests and that preferred New Coke. However, when the product hit the street, consumers did not agree with the opinions of the participants in the commercials. It took Coca-Cola’s willingness to admit to having made a mistake and the reintroduction of the original recipe as Classic Coke for consumers to return to the Coca-Cola brand. I’m sure that you have figured out by now that the solution is not to tone down your marketing enthusiasm, but to step up your game when it comes to creating an offering that can provide your customers with a positive experience. Successful marketing transcends every facet of your business — not just the advertising. Returning to the Apple experience, many faithful consumers have been created through Apple’s top-notch support. It is not uncommon to hear stories involving consumers with computers in need of repair receiving brand new replacement products at no charge. This type of customer-first customer service is making its way through the entire computer industry. Use your marketing materials to demonstrate to your audience how your offering will provide a joyful and positive experience. Follow up with a product or service that meets the expectations of your marketing campaigns. Finally, work with your team to make sure that every touch point your customer has with your company provides a positive experience. Continuing to provide positive experiences to your customers and prospects will help develop a brand that your customers will be happy to evangelize and that your prospects will be willing to pay more for.